I recently blogged about my experience going through an acquisition: M&A: Surviving the Arranged Marriage. That event has had a profound positive impact on my life. That single experience caused me to hit rock bottom professionally. I realized how much of my self-worth was tied to work, my job title and colleague’s respect. Ouch. Especially disturbing when I looked at the jewels God has given me in my life, starting with my health, husband and two daughters. How had I been allocating my time and priorities so singularly? Hitting rock bottom made me take a giant step back and get serious about finding my purpose. I’m going to spend the next few blogs teeing up exercises that will take you down that important journey of finding your purpose. I’ll introduce you to incredible people, books and websites that will inspire you to action. The journey will culminate into a singular purpose statement that will drive your life decisions and time investments. We all have gifts. Gifts that give back to the people we interact with every day. 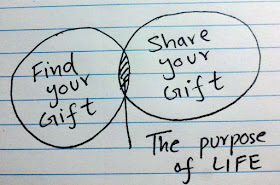 Those gifts are spiritual, core to who we are and shaped by our life experiences. 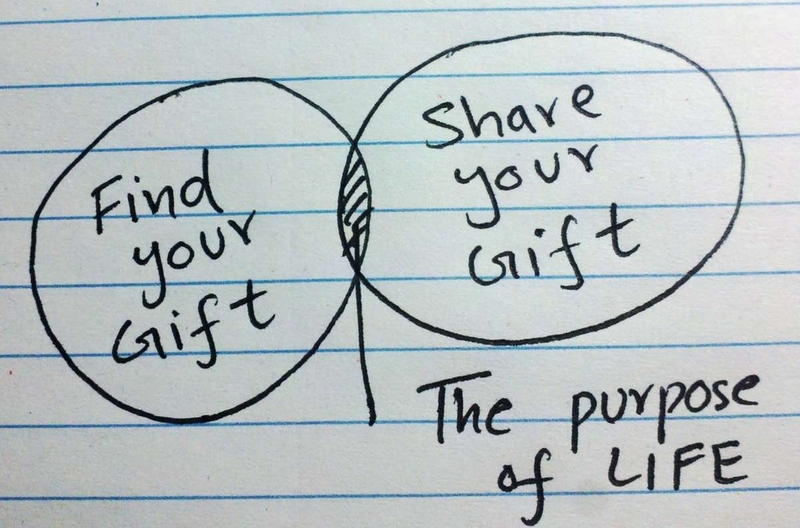 Purpose sits at the center. It drives you. It motivates you. It fulfills you in all aspects of your life: spiritual, wife, mom, athlete, professional, volunteer, friend… the list goes on. For a little inspiration, read and watch (make sure to click on the video) what Jeff Weiner and Oprah say about purpose. Warning: this is going to be work. Hard work. Mentally exhausting work. Pick 3 people that know you well and ask them to coffee, lunch or dinner. You should pick from multiple networks: friends, professional, spiritual, family. What do you think my biggest strengths are? Why did you hire/promote me? What’s your favorite story about me? What do other people say I’m amazing at? The more you ask questions, listen and talk to your trusted network, the clearer you get about your purpose. Listen for and write down the themes and stories you hear about your strengths. Answer this question: What are you doing when time stands still? Start with activities you do now. Then go back 10, 20, 30 years (school age, teens, twenties, etc.). You will start to see themes develop. You will remember stories your parents, siblings and family retell about your strengths. What you focus on. What you’re good at. I’m inspired by my three purpose sensei to freely share my new tool box: Bill Carmody, Tara-Nicholle Nelson, and Seth Godin. My purpose has never been so clear. With clarity comes action. With action comes fulfillment. Look for Exercise #2 next week and let me know how it’s going as you do the hard work.